Just clearing my windows 7 desktop and find 2 useful software+link to speed up the performance of the windows 7 desktop system. I was reading a book and just got this point well discussed into the same. Yes, I have experienced the things which author mentioned in his book in my career. After reading this, I also feel that there are vast difference between these two. And Recognition is more powerful than Praise. Praise is variable things in life. It says “You are very good” when you do good things and might be next day, you can get anger from the same people who praise just one day ago. That means for the people who are engaged in praise game, always set you up as per outcome which they expect from you. So, when you do some great job for them, they start praising like anything. and if you are not experienced enough and could not work out on any project well enough, you need to hear those statements which when we hear, we sometime pray to god, that why we have ear to hear ::). Recognition is I believe what should be applied mostly instead of praise. Recognition is on factual things, rather than value judgements. It is not complement. It is just what person has done the work from his level best. And it applied to action rather than a person. But recognition really increase the potential and motivation of the employee. When you see that someone who is not much experience doing some good work, you should recognise that work and appreciate what he/she has done. Might be this way, you just make them to feel accepted and they strive to do the good things. Today, I have tried a lot to install IIS on windows 7 home edition. I have option to install IIS but got no selection for installing the IIS console. It seems that we need to use the Ultimate edition of windows for IIS to work fully on Windows 7. At least, for now, I believe that Ultimate Windows 7 is needed to install IIS Console. Sometimes when I sit alone and see my career then the thought comes into my mind that what that keeps a developer/programmer gets going. What is the formula that kicks the programmer’s life? There are some points and experience that I wanted to share with you guys!!!! When I was in my first company, the very first project was to develop a device driver of LAN card and that too for NOVELL netware operating system. The first heart breaking project. Actually my heart was broken due to this project instead of broken due to any love affair :). We all are newbie at that time and even don’t know what is VC++ as well DDK. But, as we all friends are highly motivated and due to that we have internal healthy competition to complete the same as quickly as possible. Everybody was trying to finish given work as soon as possible and the competition was the greatest force for us at that time. At that time salary was not concern as might be it was our first project. Second project was even the more disastrous. To make a diamond planner with hardware and software interface in VC++. But we have given ample time and support as well full trust from our project manager as well as owner of the company. And that was really awesome experience to complete such a huge complex project. So I consider that also one of the point to get you going. Now, the worst life begins from this point. From next company, there are always lot of pressures and deadlines to achieve the things that are not possible either in timeline or either with technology. Without trusting the developer and doing the unnecessary pressure and demands lessen the developer’s motivation. There should be positive pressure that can work. The last and most important point that I learned in company that affect the person’s growth is what kind of people touching your work life. There are lot of people come into project like clients, project manager, customer, business manager, colleagues etc. if those people are coordinating properly and positively, the outcome will surely positive. But at most of places there are always missing thing is trust. Also, there are competition for making others wrong in the project’s problems and issues. When this starts happening, the problems starts. Each one start proving their parts right including developer. But the hit point in this politics will be the lowest level candidates. Sometimes, people use flattery and bootlicking for making others fool. They generally do this as they could not do their work properly or they afraid of the competitions. But yes, such companies has always lot of issues internally as well as with clients. Always keep positive competition going. There are sometimes we madly install lot of software and then while uninstalling the software, we forgot which one is for which use. We need to run the software and see whether it is really useful or we just installed that for trial base. So, the utility Software Informer is very handy tool on this part. 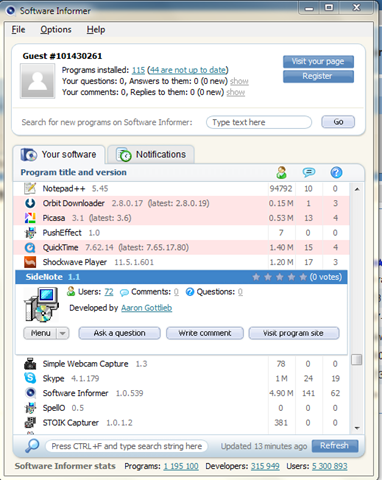 It shows the list of the software which are old and need updates. Also, it has facility to see the description of the software and review of it by going on their website. Actually this tool is to find out the outdated software on your pc but it can be used to get the information on installed softies. I find it cool to uninstall some of the garbage from my pc.